As an esteemed entity, we are successfully engaged in offering a broad range of Ecowool Tile to our valuable clients. Our offered tile is well-known in the market for its perfect finish, sturdiness and best quality. In addition, it is rigorously examined under the guidance of our strict quality examiners. The tile provided by us is available in a variety of sizes, specifications and dimensions at an affordable price. Ecowool is a light weight, compressible insulation material consisting of fine, long, inorganic glass fibers bonded together bya high temperature binder. 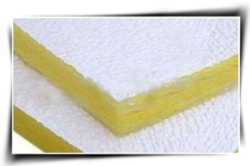 Ecowool is available in rolls, slabs and boards, in various densities and thicknesses and with a wide range of factory applied facings which include reinforced aluminum foil, fiberglass tissue, black glass tissue and a wide range of imported premium facings. We “Preksha Interiors Private Limited” are actively engaged in manufacturing and supplying a broad assortment of Aluminum Accessories, Aerocon Panel, Benito Acoustic, Clara Panel System, etc. Established in the year 1999 at Ahmedabad (Gujarat, India), we are backed by a huge infrastructure that is constructed over a huge area of land. This infrastructure is operational with all the requisite amenities. We have systematically segregated our infrastructure into different units like manufacturing, quality control, research & development, warehousing & packaging, etc. We have well-equipped our infrastructure with modern machines & sophisticated equipment.